Following the huge success of the inaugural Dubai Duty Free Irish Derby Busk and Food Festival and the Best Dressed Shop Front competition last June, Dubai Duty Free, will once again support this wonderful local initiative this June. 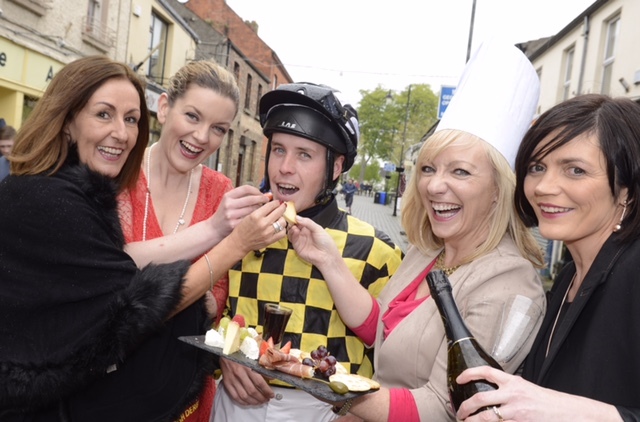 The Dubai Duty Free Busk and Food Festival 2016 will run on the Saturday before the derby, (Sat 18th of June) and will incorporate a busking competition and food village along George’s Street in Newbridge as well as a Best Dressed Shop Front competition for traders in both Newbridge and Kildare Town. Due to the success of both competitions last year the airport retailer has announced that it will double the prize fund for 2016 to €6,000 with €3,000 going to the Best Busker and €3,000 for the best decorated Dubai Duty Free Irish Derby themed shop front. The festival is the brainchild of Fiona McLoughlin Healy and together with Dubai Duty Free, the Curragh Racecourse and local traders developed the initiative in order to help create even more excitement and interest for what is one of Europe’s most exciting racing festivals. The Best Dressed Shop Front Competition will be judged by the Dubai Duty Free Executive Team while the winning busker will be decided via a public vote with the public being invited to vote for their favourite act busking on the 18th of June. In addition to the €3,000 for the Best Busker, the winning act will also get the opportunity to play on Derby Day (Sat 25th of June) at the Curragh Racecourse in front of racegoers. The winner of the Best Shop Front Competition will bag themselves €3,000 and a VIP invitation to the private Dubai Duty Free Irish Derby Pavilion on Derby Day. For more details or to register your interest in either the Dubai Duty Free Busk and Food Festival or Best Dressed Shop competition, telephone Fiona McLoughlin Healy’s Office on (045) 430046, call the Curragh Racecourse on (045) 441205 or email Aileen O’Brien, O’Brien PR on aileen@obrienpr.com. The Dubai Duty Free Irish Derby will take place at The Curragh Racecourse on Sat, 25th of June. This entry was posted in Business, GE16 Canvassing, Newbridge, Uncategorized. Bookmark the permalink.